The Galapagos Islands are a dream destination for many people. With their wide variety of wildlife, many of which cannot be found anywhere else in the world, their unique volcanic scenery and their gorgeous white sand beaches, the islands are a very special place. There’s a reason the Galapagos are called “the Enchanted Islands”! I learned about the Galapagos Islands in Biology class in high school, but I never thought I would actually make it there someday. To me, it seemed as far away as the moon! I always thought the Galapagos Islands could only be visited on a cruise. I started looking at cruise ships and itineraries, and found the prices really expensive, especially if I wanted my own cabin! While browsing forums and blogs, I realized that the Galapagos can easily be explored by land – without a cruise. In fact, land-based visitors in the Galapagos have surpassed cruise ship visitors. Many people choose a land-based visit to the Galapagos to avoid seasickness, save money or simply because they prefer exploring the islands at their own pace. The good thing about visiting the Galapagos without a cruise is that you can create and customize your own itinerary. You can visit the Galapagos on a budget, in luxury, or anywhere in between! I spent about a week in the Galapagos splitting my time between Santa Cruz and Isabela and during my time there I saw the same animals that people who take cruises do: sea lions, marine iguanas, blue-footed boobies, land iguanas, finches, pelicans, penguins, manta rays, sea turtles, giant tortoises, white-tipped reef sharks and red-chested frigate birds. I highly recommend visiting the Galapagos Islands without a cruise. There’s plenty to see and do on the inhabited islands of Santa Cruz, Isabela, San Cristobal and Floreana. Below is my guide to each island, with recommendations on where to eat, where to stay and descriptions of day trips. I have also provided some general tips for visiting the Galapagos by land. HOW LONG SHOULD I STAY IN THE GALAPAGOS? Peak season in the Galapagos is from mid-June till early September and from mid-December through mid-January. So if you don’t like traveling in peak season, avoid those times. I went there in late November and thought it was a good time of year to go. I recommend staying at least a week in order to fully enjoy the Galapagos and its wildlife. If you have a week I recommend basing yourself on two islands. If you have more than a week, you can stay on all three main islands. When I was in the Galapagos it was the American Thanksgiving holiday and I met quite a few tourists who were only visiting the Galapagos for 3 or 4 days! In this case I recommend staying only on Santa Cruz or San Cristobal. The only way for tourists to get to the Galapagos Islands is to fly there from mainland Ecuador – either Quito or Guayaquil. Quito is a historic city surrounded by mountains while Guayaquil is a bustling port city. There are three airlines that offer flights to/from the Galapagos: LATAM, Avianca and TAME. LATAM has a reputation for being the most reliable while TAME is the least reliable. I flew LATAM to and from the Galapagos and had a positive experience. You can fly into either Baltra or San Cristobal Airport. Baltra: Located on a small island next to Santa Cruz island, this is the world’s first ecological airport due to its reduced energy consumption and rainwater recovery. San Cristobal: This airport is located just a 5 minute drive or 15-20 minute walk from the town of San Cristobal. •At the airport in Quito or Guayaquil, you will need to get a Transit Control Card. You will see signage directing you to a booth where you will show your passport to an official and tell them how long you will be staying in the Galapagos Islands. After you pay $20 in cash, they will print your information on a card and give it to you. • After getting your Transit Control Card, you will put your check-in and carry-on luggage through a security scanner. This is to make sure you don’t bring any forbidden food or animals to the islands. After your luggage passes the scan, a security officer will put a tag on your suitcase (usually on the zipper part where you would put a lock). • If large cruise groups arrive at the airport at the same time as you, there will be long queues for the Transit Control Card and security. Therefore, you should arrive at the airport 3 hours in advance. I did and I didn’t have to wait at all! • Upon arrival at the airport in the Galapagos, you will have to show the immigration officer your Transit Control Card and pay the $100 national park fee. Remember to bring enough cash to pay. • When your luggage comes out on the conveyer belt, you can’t run over and collect it right away. You must wait for a sniffer dog to check all the bags first. There are two main ferry routes in the Galapagos- the Santa Cruz/San Cristobal route and the Santa Cruz/Isabela route. There are ferry departures twice daily – once in the morning and once in the afternoon. From Santa Cruz ferries leave at 7:30 am and 2:30 pm to both Isabela and San Cristobal. From Isabela ferries leave at 6am and 3pm to Santa Cruz. From San Cristobal ferries leave at 7am and 2pm to Santa Cruz. When planning your trip, don’t forget that there is no San Cristobal/Isabela ferry route. There are also ferries available to Floreana but on a less frequent basis. When you hear the word “ferry”, you might picture one of those large ferries that you drive your car onto and dine in the cafeteria and browse in the gift shop during your ride. But in the Galapagos? Nope. The ferries are nothing like that. They are actually small speedboats that hold around 20 or so passengers. Several ferries depart at the same time. Due to their small size ferry rides can be quite bumpy, so take anti-nausea pills if you suffer from seasickness. Some people prefer to sit at the back of the ferry where they can get fresh air. I sat in the covered interior part. You can buy ferry tickets from any tour agency. They will ask for your name, contact details and passport number and tell you the boat name and what time you need to show up at the docks. Usually it is half an hour before departure. Ferries cost $30 each way. When you get to the docks keep an eye out for people holding clipboards. They will ask for your name and check if it is on the list. Then you will receive a pass with the boat’s name to wear around your neck. After this, your luggage will be inspected to make sure you are not bringing any introduced species like live animals or exotic fruits to other islands. The inspector will unzip your bags and take a look inside. Next you will wait around with the other passengers on your boat until someone yells your boat’s name. Then you will take a water taxi to the ferry. These water taxis cost between 50 cents to $1. Crew members will help load luggage onto the water taxis and ferries. On my ferry ride to Isabela, most of the passengers were only going there on a day trip so they had no luggage. As a result, I was the only passenger who had a suitcase! But on my way back to Santa Cruz a lot of people had suitcases or large backpacks. When I boarded the ferry I noticed a roll of plastic bags hanging from a pole. These are barf bags in case someone gets sick. The ferry ride from Santa Cruz to Isabela was extremely rough and bumpy. A girl nearby me put a sweater over her head for the entire duration of the ride. Some people prefer to close their eyes during the ferry ride, but I find doing that makes me concentrate more on the rocking motion so I prefer to keep mine open and just watch the view. Two girls threw up on the ride to Isabela, but only a kid threw up on the way back to Santa Cruz. The Isabela- Santa Cruz route was much smoother. Emetebe Airlines operates small planes (usually with 9 seats) that transport passengers between the islands (except for Floreana). You can book at their office in Puerto Ayora (although it never seemed to be open whenever I walked by) or through a travel agent and the price is more than $150. Unlike other destinations, there isn’t really a bad time of the year to visit the Galapagos. The weather is hotter and wetter from December to May and cooler and drier from June to November. The hottest and sunniest months are February and March. The crime rate in the Galapagos Islands is extremely low. It is among the safest places in South America. The greatest dangers you will face are getting sunburnt or falling on rocks. Since the Galapagos Islands are located next to the equator, the sun is extremely strong. Bring plenty of sunblock with you, especially if you are fair-skinned like me, and remember to apply it EVERYWHERE. Don’t forget the backs of your legs especially if you are snorkeling. I did and got burnt there. Reapply your sunblock after swimming or snorkeling. I used SPF 50+ sunblock. Remember that your scalp and hair can get damaged from the sun too, so wearing a hat is a good idea! A burnt flaky scalp is unsightly and uncomfortable especially if you have dark hair! Covering up your skin is also a great way to avoid sunburn, especially when snorkeling. You can wear a wetsuit or a rashguard over your swimsuit. When walking on some islands during day trips or getting into the water for snorkeling, be very careful as sometimes there are sharp rocks. Don’t walk barefoot or use flip-flops to walk on the rocks. Water shoes will protect your feet during wet landings. Tap water in the Galapagos is not drinkable. To play it safe, do not even brush your teeth with it. Most hotels have water tanks that you can fill up your water bottle with. Bottled water is also available in many stores. If you want to be more environmentally friendly consider bringing your own water bottle. Most day trips in the Galapagos include snorkeling time. The snorkeling skill level among the people on your day trip will vary. Don’t worry if you cannot swim or are not a good swimmer. On quite a few the day trips snorkeling is done from the beach rather than in deep water. You can ask for a life jacket to wear and just float on the water. If you tell your tour guide in advance they can also get into the water with you and help you. On one of my day trips there were several people who couldn’t swim and they still went snorkeling and enjoyed themselves. However, it would be better if you practice floating and swimming in your local pool with a snorkel mask on before you go to the Galapagos. I can swim but don’t have much experience swimming in the ocean so I wore a life jacket for most of my snorkeling. This also makes it easier to take photos and videos without worrying about staying afloat. A lot of people wear a shorty or long wetsuit to protect themselves from the sun and to keep warm. Some tour agencies include wetsuits in the price or you can rent them for an extra fee. Most tour agencies provide snorkel equipment (mask, fins). Make sure you ask the agency what is included when booking your tour as you don’t want to end up sharing fins with five other people and waiting for your turn to snorkel. Wetsuits are quite cheap to rent ($5 a day) but if you have your own equipment and wetsuit you may want to bring it to the Galapagos. The Galapagos is one of the best places in the world to scuba dive. In some spots you can see huge schools of hammerhead sharks. However, diving in the Galapagos is not for beginners as the currents can be very strong and visibility poor. There are some agencies that will take you on scuba diving day trip even if you are a complete novice but they don’t really specialize in lessons for beginners. You are better off learning to dive somewhere with easier water conditions and good training facilities for beginners like the Caribbean. Advanced divers usually take liveaboard dive tours which take them to the faraway islands of Wolf and Darwin which are only accessible to divers. Scuba diving day trips are also possible though. You usually need at least 20-30 dives to do these day trips. The most famous scuba diving day tour from Santa Cruz is Gordon Rocks and from San Cristobal, Kicker Rock. The native language of Galapagueños is Spanish but most people working for tour agencies like guides and travel agents can speak English. However, you will still meet many locals who speak little or no English like boat crew members, taxi drivers and restaurant staff. In my opinion it’s worth learning some basic conversational Spanish before your trip as being able to talk to these locals will make your experience in the Galapagos much more positive and memorable! Wifi in the Galapagos is very slow. When watching videos or making video calls, expect a lot of lag. Santa Cruz has the best wifi, with San Cristobal coming in second and Isabela and Floreana coming in last. There are two main cell companies that operate in the Galapagos: Movistar and Claro. You can buy an Ecuadorian SIM card on the mainland or in the Galapagos. I kept my own SIM card and had an international plan that alternated between Movistar and Claro depending on my location. Claro has a reputation for being more reliable than Movistar. On Isabela I couldn’t get a 3G signal anywhere but I could on Santa Cruz. The Galapagos Islands is still primarily a cash-based society. Major hotels and some tour operators do accept credit cards, but most shops and restaurants don’t. If you book your day trips online you can pay with credit card or PayPal but if you book in person they usually prefer cash. You may face additional fees if you pay for tours by credit card too. ATMS are available on Santa Cruz and San Cristobal but not on Floreana or Isabela. If you are going to Isabela or Floreana make sure you have enough cash to cover your entire stay. It would be terrible to miss out on a tour or go hungry because you don’t have enough cash! Even before you arrive in the Galapagos, have some cash ready to cover the $100 national park entrance fee. Like the rest of Ecuador, the currency in the Galapagos Islands is the US Dollar. In the Galapagos (as well as the rest of Ecuador), US $1 coins are frequently exchanged. This may be surprising to Americans who rarely or never use $1 coins at home. You can still use $1 bills though. As it can sometimes be difficult to get change especially on Isabela and Floreana, bring some smaller bills and coins with you. You will need change to pay for water taxis and snacks. Click here for my recommended packing list for the Galapagos Islands! Puerto Ayora on Santa Cruz Island is the main hub for the tourism in the Galapagos. It is a great place to base yourself as you take day trips to other islands. You can also spend a few days exploring the island, visiting a tortoise ranch, the Charles Darwin Research Station, the beach at Tortuga Bay or enjoying fresh seafood. READ MY GUIDE TO VISITING SANTA CRUZ ISLAND HERE. Isabela is the largest island in the Galapagos, but Puerto Villamil is the only town. It has a population of 2000 and a very laid-back, beachy vibe. The main street where most hotels are located is sandy and unpaved. The sunset views from Playa Grande, which is Puerto’s Villamil’s main beach, are amazing! Remember that there is no ATM on Isabela and not many places accept credit cards so bring enough cash for your stay there. Ferry connections to Isabela are only available from Santa Cruz. Ferries leave daily at 7am and 2pm and the journey takes about 2 hours. Isabela has a small airport, so flying there from Santa Cruz or San Cristobal on Emetebe Airlines is possible. All foreigners must pay an entry tax of $10 at the docks upon arrival to the island. Probably the cheapest option on Isabela. You can get a bed in a coed dorm room for about $20. I stayed at the Volcano Hotel and the ladies at the front desk were so nice, always asking what time my tours were so they could arrange breakfast for me! When I arrived I was given a refreshing welcome drink, which I really appreciated after the ferry ride! My room was clean and modern. The wifi in the room was terrible, but that is not the hotel’s fault as the wifi on the whole island is very slow. You can get a decent signal in the lobby. Hotel Albemarle is just steps away from the beach with lovely views of palm trees. Scalesia Lodge is in the middle of the forest on Isabela Island. You can stay in a luxury safari tent and eat your meals in the main lodge. This restaurant is often called the best on Isabela. I ate dinner here twice and tried the tuna tataki and a taco which were both pretty good. Across from the town square is El Velero, where you can eat a set meal or order from the menu. I had a sandwich with plantain chips. Known as the “pink house” in Spanish, La Casa Rosada is a popular beach bar for both tourists and locals to hang out. In the evenings you can relax in a hammock or bean bag and watch gorgeous sunsets from here. If you’re feeling adventurous, you can try out the slackline (which is like a tightrope). At the end of a boardwalk trail covered with sleeping sea lions is Concha de Perla, a place where you can hop in the water and go snorkeling. Bring your own snorkeling gear here or rent it in town. Here you can swim with sea lions, rays and fish. The water is calm and perfect for beginners. From town you can follow a 7 mile long path to the Wall of Tears. The hike is very long (about 2-3 hours each way) so a lot of tourists rent a bike to go there, which reduces the journey to one hour each way. I didn’t want to do such a long hike and I never learned how to ride a bike (don’t laugh!) so I didn’t get to see the Wall of Tears unfortunately. The Wall of Tears was built during the 1940s and 50s by prisoners who toiled every day in the hot sun. As they had to carry heavy lava rocks many of them died, which is how the wall got its sad name. During the hike you will also see a magnificent view of the forest and ocean. At the tortoise breeding center, you can see tortoises of all ages. The baby ones are especially cute! Behind the center there is a flamingo lagoon. Los Tuneles is a must-do day trip while you are on Isabela! I saw a few penguins during the boat ride. You will take a walk on lava rocks that resemble bridges. Cactuses grow on these bridges, which makes them very unique. You can spot many blue footed boobies nesting here. You will also go snorkeling under these bridges. The gaps under the bridges look like tunnels, and in these tunnels you will find white-tipped reef sharks. I went with Pahoehoe Tours and Gabriel was an excellent guide! He was very enthusiastic about the tour even though he does it almost every day! He took photos of the group and the wildlife and loaded them onto everyone’s memory card or USB stick in the office at the end of the tour. While snorkeling I saw turtles, a seahorse, colourful fish and reef sharks hiding in caves. Gabriel helped push each tourist’s head under the water so that they could see the reef sharks. Near the main pier in Puerto Villamil is Las Tintoreras, a series of rocky islets where huge colonies of marine iguanas live. You will take a walk around the iguana colony and also peek into a lagoon where white tip reef sharks rest. The snorkeling near Las Tintoreras is great because the water is calm. I saw many large sea turtles! On the boat ride near Las Tintoreras I saw a couple of penguins. Read more about my day trip to Las Tintoreras here. Sierra Negra is one of five active volcanoes on Isabela island. With a guide, you can hike to the edge of the caldera for impressive views. I opted not to do this excursion as I was more interested in seeing wildlife than hiking. If at least 5 people sign up, Pahoehoe offers a deep water snorkeling excursion at Isla Tortuga where you might see manta rays and hammerhead sharks. You will also go to Loberia Grande, where you can try fishing with the crew or do more snorkeling. 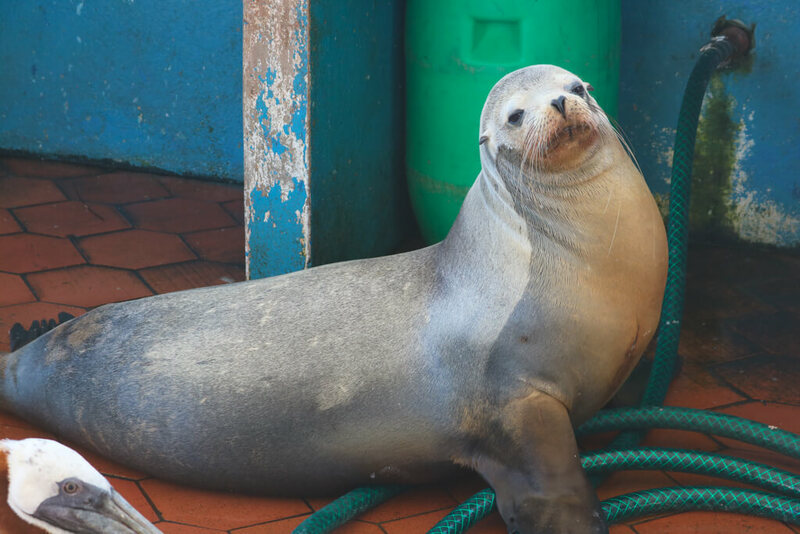 San Cristobal Island has a huge population of sea lions and you can see them from the waterfront boardwalk in town, making it a sea lion lover’s paradise. It is a great base for budget travelers due to the abundance of free or cheap activities, including snorkeling. From San Cristobal Island you can catch two of the best day trips in the Galapagos: Kicker Rock and Española. READ MY IN-DEPTH GUIDE TO WHAT TO DO ON SAN CRISTOBAL ISLAND HERE. Floreana has the smallest population of the four inhabited islands but the most fascinating history. It used to be a hideout for pirates and in the 20th century there was a scandal involving possible murders and mysterious disappearances. Its post office barrel, the first mailbox in the Galapagos, is world famous. You can take a day trip here from Santa Cruz and visit Floreana’s highlands, snorkel at Black Beach or La Loberia, and drop off a postcard at the replica of the post office barrel. Or if you are craving peace and isolation, you can stay overnight on Floreana. Due to the lack of lights on the island stargazing there is amazing. Read more about Floreana in my detailed guide about where to stay, where to eat, and what to do on the island. I hope you found my guide helpful! Which islands would you like to visit most? Tell me in the comments below! Wow, this is packed with so much great information! Thanks for the detailed write-up! If I’m ever so lucky to visit the Galapagos, this is the post I will read to plan my trip. The useful information on how to get to round and what to see together with the stunning photos is incredible. I’ll definitely opt for this non-cruise option. This post is full of fantastic information! Thank you!! I so want to go to the Galapagos, but not on a cruise. This will be a handy guide. You know it’s hot when even the iguana are looking for shade. It’s been my dream to go here and swim with sea turtles since I was a kid! Thanks so much for sharing this. This is so detailed and awesome! I’d never really thought of visiting the Galapagos just because it was never that high on the list but now I’m thinking I’ll need to move that up! Such great information here, thanks! I’ve wanted to go for a long time but haven’t ever really looked into the details. I assumed we’d have to just take a cruise, so it’s helpful to know that there are other ways to do this. Omg those pelicans and iguanas! So amazing these creatures. I would love to visit the Galapagos island someday. I adore animals. Thanks so much for making my day with these photos!